I don’t know how you feel about this whole carousel of champs thing, but I do know the 4- and 3-time champs on the TOC bubble are lovin’ it. Phil Salathe is our tenth consecutive different player at podium #1 – and he is trailing heading into Final. For the first time in a while, we have a Shore’s Conjecture situation. If Phil doubles his score, he’ll have 26,800. 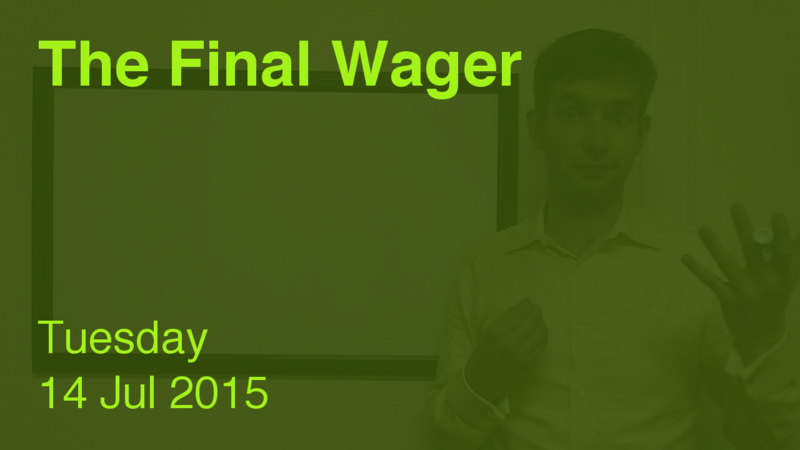 To cover this all-in wager, Ben will need to wager 10,600. An incorrect response with that wager will leave Ben with 5,600. To stay above his total, Phil can wager up to 7,800. Val must respond correctly to have a shot, so all-in is the way to go. A successful doubling will put Val at 8,800. To stay above her, Phil can wager at most 4,600. Ben could wager at most 7,400. If Phil chooses to stay above a double-up by Val, he will have at most 18,000. Ben can cover that with a wager of 1,800. To get above Ben’s “Shoretegic” total, Phil must wager 1,000. If Phil makes the rational maximum wager of 7,800, Ben will need to wager 5,000 to cover him. If he’s wrong with that wager, he’ll be left with 11,200. To stay above him, Phil can wager up to 2,200. Val’s forced into her wager, but Phil and Ben have a host of options. If I’m Ben, I take my destiny into my own hands. If I’m Phil, I make the Shoretegic play. A triple green! And a new champion! Oh, what a night! I thought this was a tough clue – nice job by the two gentlemen to get it. What’s funny about this situation is that the exact same scores for 1st 2nd and 3rd happened on July 14, 2014, one year ago exactly.